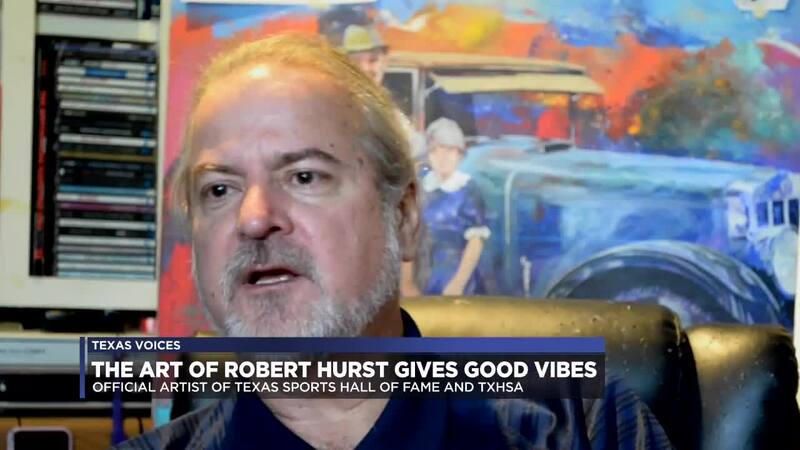 (KXXV) — The art of Robert Hurst is a door into the ultraviolet world of superstars in music, sports and all things Texas. "I'm painting my heroes. My music heroes, my sports heroes," said Hurst. His artwork gives good vibes. In a camera-filled room at the Texas Sports Hall of Fame in Waco, the talk turns to tribute. Not for the bevy of hall of fame athletes but the artist who captures them on canvas. "It's unbelievable, right?" said 2019 inductee and former professional basketball star Nancy Lieberman. "It embodies her sparkle. It embodies her grace. You can see a determination in her eyes and this is right before she played in one of the grand slam tournaments," said Cindy Brinker Simmons, the daughter of 2019 inductee and teen tennis sensation Maureen Connolly Brinker. The Official Artist of the Texas Sports Hall of Fame and Texas Heritage Songwriters' Association are positions Robert created. "I just walked in one day with a portfolio and said I have this idea," said Hurst. The post is constantly pursued in the highly competitive sports art arena. "The first five years probably a hundred artists tried to knock me off my pedestal," said Hurst. But it's been 20 years and Robert remains. Partially from the striking imagery he projects but also who he is...as an artist and a Texan. "A seed is gonna grow. No matter where it is. It will grow through concrete," he said. In his studio, Robert paints in Wrangler jeans and bare feet. A reflection of his South Houston roots and replanting in South Austin. "When I came here I had fifty bucks and two boxes of clothes and I was actually going to go to California. I thought I'd had enough of Texas. I'd hit rock bottom," said Robert. He counted from the time he was about 12 years old, he's had 48 jobs and got fired from 43 because it wasn't until he became a full-time artist at the urging of his wife Pam that life became vibrant for the virtuoso. "What you have to be is yourself and pursue where your heart is and where your head is," he said. You can see from his paintings, it's somewhere between the stars. A boyhood fascination with NASA and the musical influences from his generation seem to peek through the paintings. "It's loose and it's tight. There's enough information that you have to figure it out yourself, but you don't realize the information's not there. You're already putting it there and that's my trick. Putting enough information there for you to finish the painting," said Robert. And although he is a self-proclaimed wallflower, the arts speaks for him. Through the crack of a bat or channeling a creative frequency you can feel. "I'll never retire. I'll do this hopefully, I'll drop dead in my chair one day," said Robert. You can commission Robert's artwork or learn more at his website . "Texas Voices" features the artists, creatives and musicians in our great state.